A mountain lion spotted in the Hollywood Hills last week is the same mountain lion that made Griffith Park home in 2012 after a 20-mile trek from the Santa Monica Mountain, according to one wildlife expert. Surveillance footage shows the lion taking a stroll along Holly Ridge Drive the morning of March 5, roaming among multi-million dollar homes. "That’s our car right there," one neighborhood resident said as he watched the footage. Officer Greg Randall, wildlife specialist with the city of Los Angeles, said this mountain lion is "definitely" the mountain lion known by scientists as P-22. P-22 was tagged with a GPS collar in March 2012. The 4-year-old mountain lion had left the Westside of the Santa Monica Mountains and reportedly made its way to Griffith Park after crossing the San Diego (405) and Hollywood (101) Freeways. A photo of the lion was captured late last year by a National Geographic Photographer. One neighborhood resident said she came face-to-face with the mountain lion. "I was startled at first, I paused and just backed up and closed the door. And then went, ran down I’m like, 'I cant get to my car there’s a mountain lion in the way!' And everybody thought I was just out of my mind,” she said. Randall believes that the mountain lion made a visit to this neighborhood because he was looking for food. “It’s very possible he’s looking for a mate,” Randall added. 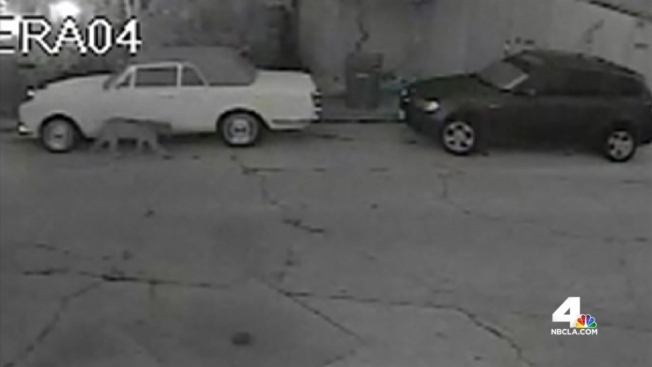 Last week, a 100-pound dog was killed by a mountain lion in the back yard of a Fontana home.